Today’s article is going to be all about healthcare- domain/business information, components, what to test and how to test. This two-part article series is useful for anyone who wants to explore and enter into a different domain for testing, learn and understand healthcare application workflow and testing process. In short, this article will be your first step and a guide on your healthcare knowledge quest. In part 2 we will provide test scenarios for different applications under Healthcare domain. To really excel in testing, domain knowledge is the key. So, we are going to learn the client’s business flow now. How to test healthcare application? Health Care or Health Insurance is similar to general insurance. As you know, in any insurance, insurer (Insurance company) will provide the plans and customer (Subscriber or Policyholder) will buy the policy of his desired plan. The insurer will receive the premium amount from the policyholders and the policy Holders will get reimbursements from the insurer for the valid claims they have submitted. The same happens in healthcare insurance but in addition to insurer and policyholder, there are other major contributors such as provider, TPA (Third Party Administrator), broker, etc. An entity which creates a plan, sell the policy and reimburses policyholder or provider for the submitted valid claims. A person or an entity, who buys the policy from the insurer or broker, pay premium to the insurer and sometimes submit a claim. A person or an entity, which provides the healthcare service to the policyholder and their dependents, either receive payment for the service from the policyholder or from the insurer by submitting a claim. As you have guessed, he is an agent who sells the policy to the customers on behalf of the insurer and receives a commission in return from the Insurer. Example: We can understand the basic function of contributors from the below example. Mr Enosh bought a health care policy which covers general physician consultation and vision problems from Mr Ponnar and pays a premium for the same to HealthCorp company. Once Mr Enosh was sick and consulted the Physician Mr Sabari for recovery, Sabari provided a prescription to Enosh and submits a claim for the consultation to HealthCorp Company and receives the reimbursement. Mr Ponnar receives a commission from HealthCorp Company for the payment of premium by Mr Enosh. In the above example, ‘General Physician Consultation' and ‘Vision Problems' are the benefits of the health plan, Mr Enosh is the policyholder, Mr Ponnar is the broker, HealthCorp Company is the insurer and Mr Sabari is the provider. To clearly understand the difference between policy and plan, think plan as a class and policy as an object ( an instance of the class). Policy can be categorized as individual policy and group policy based on the type of beneficiaries it covers. An individual will be the policyholder; both the individual and his/her dependents will enjoy the benefits of the health plan. Here the individual pays the premium. An entity (Generally an employer) will be the policyholder, the members (Employees) of the entity and their dependents will enjoy the benefits of the health plan. Here the entity pays the premium. MotoCorp Company buys a policy from HealthCorp Company for its employees and their family. Their claims are managed by EasyClaim Company. Here MotoCorp Company is the policyholder, HealthCorp Company is the Insurer and EasyCliam Company is the TPA. Before testing an application, we should be aware of healthcare industry workflow. The previous topic just gives an introduction to managed health care, more details are available here. This might not be an exhaustive list. But, this is the list to the best of my knowledge. Also, all applications might not even be used. Sometimes, few of these applications are merged to make another combination application- other times, these are stand-alone systems. 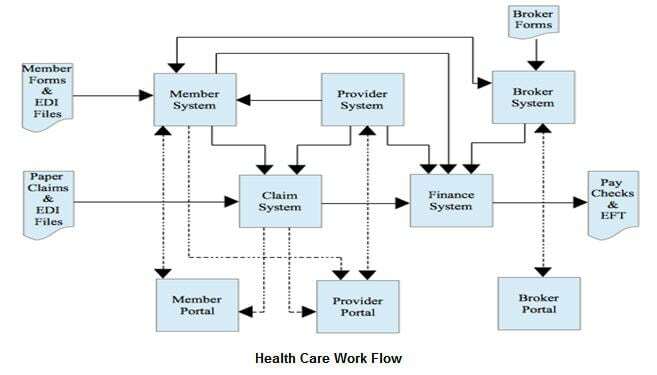 For example, Provider system can be part of Member system in some healthcare application. By healthcare application, I mean a set of systems maintained by an Insurer to facilitate their customers and partners. For a member/policyholder to be enrolled in a health plan he/she need to be assigned to a provider (Primary Care Physician) or a provider network, so there should be a way for member system to validate the assigned provider. Either member system connects to the provider system or a data feed should periodically send to member system from provider system. Therefore provider system should be tested and ready to use before testing member system. A claim should consist of provider ID and member ID in addition to other details. Claim system should validate both the member and provider in order to validate the claim, so both member and provider system should be tested and ready to use before testing claims system. Finance system needs to have data from a member, provider, claim and broker system to write checks or make EFT payments to the respective person or entity. Provider and broker systems are stand alone. Portals should be tested at last since it needs data from the other applications. Now, that’s the order in which the systems in healthcare application should be tested. The above-mentioned information should give us enough momentum to get into “How to test” the healthcare applications, which will be dealt with in the next 2nd part of this article. About the Author: This is a guest post by Vairavan R M. Author is having good experience in testing Health Care Applications and leading a team in a Multinational corporation. In the meantime, if you have any question or comments or need any help in understanding the Health Care domain better, please let me know. Stay tuned for the next article in the series. How to Find Maximum Valid Defects in Any Application? Health insurance or policy related details are will come under Insurance related domain. Superb! Thanks for accepting my request to cover article on healthcare. @ Manoker – Agree, we have taken Health insurance domain application as an example to get started in this domain! I was waiting to understand Health Care Domain. Thanks for the post. Thanks for the comments. We will keep you posted on the date of publish of the second part of this article. My best Wishes and thanks for provided valuable information in part1 it self to all of them . This is good and important topic, I will be waiting for part 2. I’m working as test Engg with an EHR software which don’t have detailed functionality of providers/brokers.We are having modules like IP,OP,ER.Please include these workflows too. can i get the some examples of websites those are in health care domain ? Kindly let me know the information about Gym products. i thought even Gym facility comes under Health Domain.kindly rectify ……Help me out with the application,test cases, and how to automate it. Very informative.Can u please provide articles on Testing BFSI domain ? Nice information , I would request to publish article on SAP functional (Finance , HR ect) as SAP is more complicated and interesting to know. Very informative.Can u please provide articles on MR Reporting System (Medical Representative) ? Thank you for the post , waiting for Part 2. @ all – thanks all for your comments and huge support. The first article was mainly to introduce you to the healthcare domain (health insurance as an example). In second part we will explain how to test this application with test scenarios. Also we got your inputs and soon we will provide more domain info (downloadable) on Healthcare, BFSI and other domains. Thanks for giving an idea about the Health Insurance Domain testing. Waiting for part 2….hope it will cover Health Care Domain (Hospital related) also. Hi sir.This is suresh Reddy. Thanks for nice presentation.i got some knowledge after reading this part1.will wait for your part2 and future other domain . Thanks. I need help in understanding the Health Care domain better. Hope you have read the second part, to explain the points you have mentioned takes much time. The main aim of this article is to give an introduction to health care domain and show a way to test the end to end flow of a health care application. Sorry that I haven’t been detail but you can always go through the book that was mentioned in the article for more details. Please post a project about Banking domain asap. How to test Banking application. I want to know about Banking, Financial services and Insurance (BFSI) domain. How to test BFSI application. Can you please provide an understanding on testing on portfolio management project?? is there anyone can help me how to write this project for the resume.Help will be appreciated. It is a nice article. Please keep on writing. Thanks !! I NEED A MANUAL TESTING LIVE PROJECTS ON Health care project. Guys you can refer this video which can clear your doubts that how Health Care applications are working but this video will tell you the Billing part so refer and share the comment i’ll try to search and provide more on my next visit. Thank you very very much. Its realy very clear to understand. This is mainly Healthcare insurance ….This is not healthcare applications.. This is basically about health insurance but what about various application used for health care services & various health care app. Any details on testing those type of health care application? In healthcare there are different areas to be tested. the insurance is used in different ways and billing is also done in different ways. I want to know how healthcare industries will use software testing technique?